Early maps of the world put dragons to indicate unexplored parts of the world. They were warnings that no one knew what lay beyond the known edges of the world. There are dragons all around San Miguel. 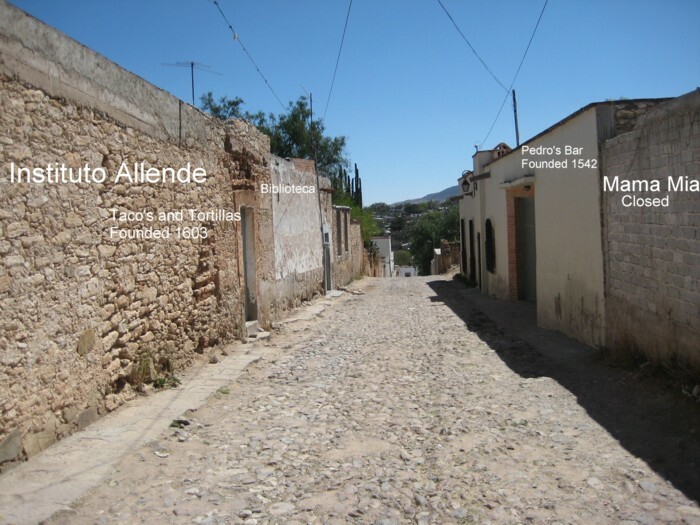 There places up the hill such as Atascadero that can only be reached by donkey or a Mercedes. There are places in the campo such as Los Frailes that are rumored to be US refugee centres. There are places called Gated Communities and it is not clear if the gates are to keep people out or keep people in. 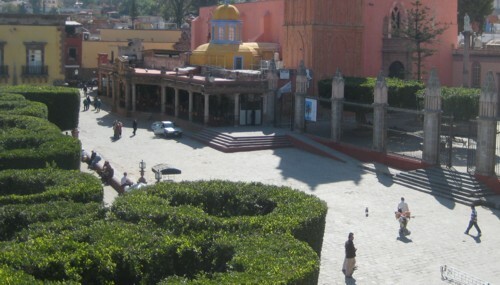 The average visitor to San Miguel never goes near the places marked with Dragons but spends their day in the Jardín, sitting and looking and waiting. 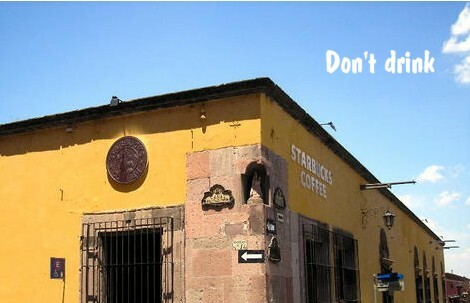 This picture show the front of the Jardín where you can sit and not look at Starbucks or Dunkin Donuts. It is here that the Gangs come and go. 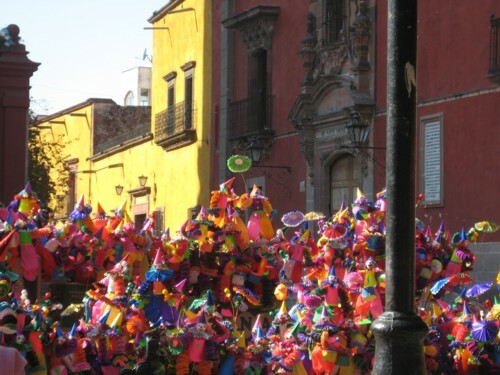 Life begins in San Miguel on Friday. This the is day Atención comes out and lays out the activities for the week. Atención is published by the Atención Gang. It tells Gang members What to do and Where to Go. A typical day involves walking the dog, then a cafe, then a good sit on a bench. Then some talk about real estate or how terrible it is that Starbucks opened. For the rest of the day until evening members of each Gang does their own thing such as setting up tables to spread the word, or suggesting other places in Mexico to live, capturing a Love Slave, buying books, shopping, making Mexican Friends, being busy, buying art, taking art classes or what ever mission the Gang Mamas have set for the day. The evenings are devoted to ART – a play, a muscial performance, a reading, a musical comedy, a lecture. Here is an excerpt from May 9 Atención describing the merriment that is going to happen after that first cocktail. Concert-goers at the San Miguel event are warned that Thiam is still just as persuasive. Probably everyone in the Café will be dancing within the first 30 minutes, and never mind if they’ve never given the least thought to West African rhythm. It’s irresistible. Imagine all the fun you would have. 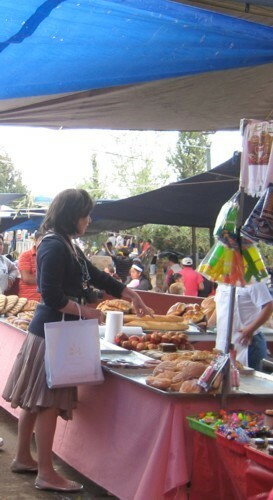 Life in San Miguel is one art adverture after another until you go to bed fully arted out. Sometimes it goes wrong in San Miguel. While you might doubt if you could go too far in San Miguel, this gang is proof that it is possible. 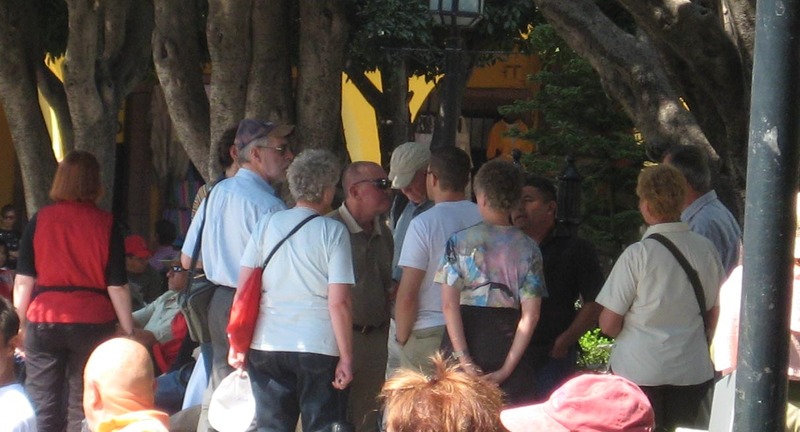 Early gang activity in San Miguel was benign: a simple tablecloth worn over the shoulder, dressing from head to toe in blue, getting a facelift, wearing a red hat or saving a dog. But some people are not content with understatement. They want to be seen. They want to make a difference. They want the full experience. Hence the Clown Gang. They are in your face honking their horns. 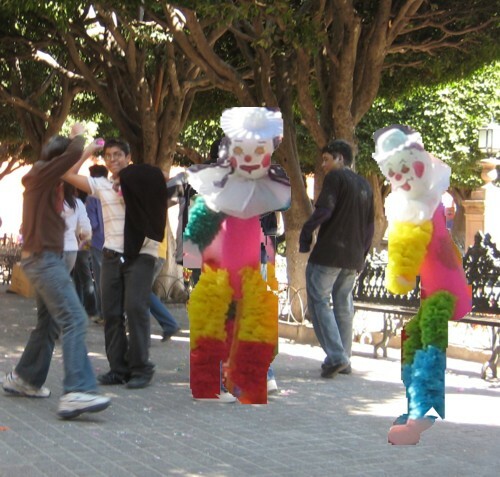 They are playing tricks on tourists (an easy target). They are sitting beside you in the Jardin giggling. They are spilling pozole beside you in a restaurant. They are buying up all the Atencions. Despite the name, they aren’t much fun because they demand your attention. There is a movement afoot in town to drive them away like the grackles were driven from the Jardin but until it happens, the best advice is not to make eye contact or engage them. But remember too much rouge doesn’t make you a clown. You might think that the person beside you is a clown but it might be a woman who simply doesn’t understand the rules of makeup. Please keep the Jardin/Centro free of commercial business and familiar looking signage which distracts from the historic and Mexican flavor of our wonderful town. We fully support Joy Emery’s fine February 22nd letter to you indicating her disappointment in the announcement of a Starbuck’s Coffee House on the Jardin’s perimeter. Where is our historic police force, INAH, in this important decision? A better location would be near Gigante, Mega or the newly announced Wal-Mart Store. My experience with Starbuck’s in California and particular, San Francisco, is that their locations become a major pedestrian traffic jam and their customers use the facilities as a second office (cell phones, computers, etc.). Let’s not disrupt the existing businesses in the Centro with yet another major competitor. The next thing we know, Peet’s Coffee will want equal billing across the Jardin, to be followed up with a Chili’s, Burger King, Wendy’s, etc. Slow down the growth! 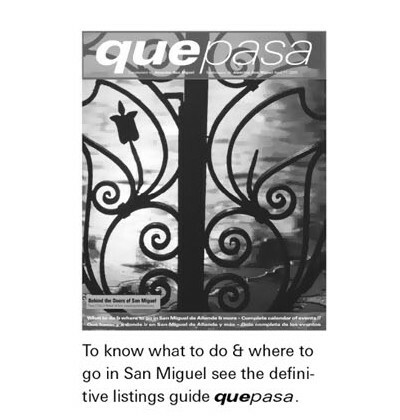 We recognize the financial impact to San Miguel but not at the expense of its charm and reputation. At the far end of the Gang Spectrum lies the Cheap Gang. For whatever reason this gang can neither afford to buy art nor take art classes. This gang is about the bargain. You know you are talking to a member of the Cheap Gang when they ask “What did you pay for that?” and then they tell you where they can buy it cheaper. Another favorite topic of conversation is talking about places where you can eat for 25 cents or less. It is difficult to find the habitat of members of the Cheap Gang. Being Cheap and Real Estate expensive, they will only rent. Below are two ads from Atención can you figure out which apartment would be rented by a member of the Cheap Gang. This Gang breaks all the clothing rules. Their calling is the Art of saving money. So the tag line to anything they wear is “I only paid 20 <lower the amount the better> pesos for this. Where do they find clothes that cheap — The Tuesday Market. 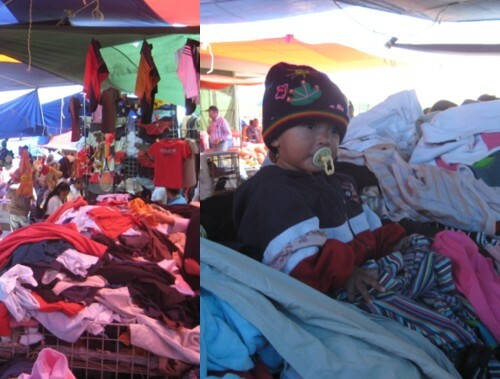 Here they can buy there clothes for 10, 20 and 30 pesos. They have learned to be careful as some of the clothes are used and a few come with children. Most food by the Cheap Gang is bought at the Tuesday Market. Mega and Gigante are dirty words. Notice that the finger pointing indicates she can’t speak any Spanish. Most members of the Cheap Gang don’t own dogs. They find it expensive to feed them so they like to own pets that they can eat when they are bored with them. 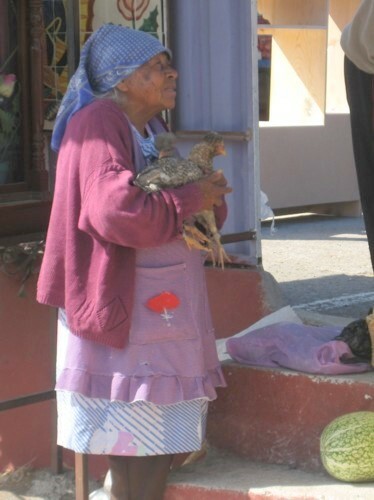 Here is a very popular Tuesday Market Vendor holding the most popular Cheap Gang pet in San Miguel – the chicken. The Navajo Indian Tribe believe that if you take a picture of them then you have taken their soul. They are not alone in this believe as evidence by this picture. The Roman Soldier in this picture was part of the Juan de Dios Celebration in March. But look behind him and see a member of the Soul Capturer Gang. She believes she can capture someone’s soul with a picture. 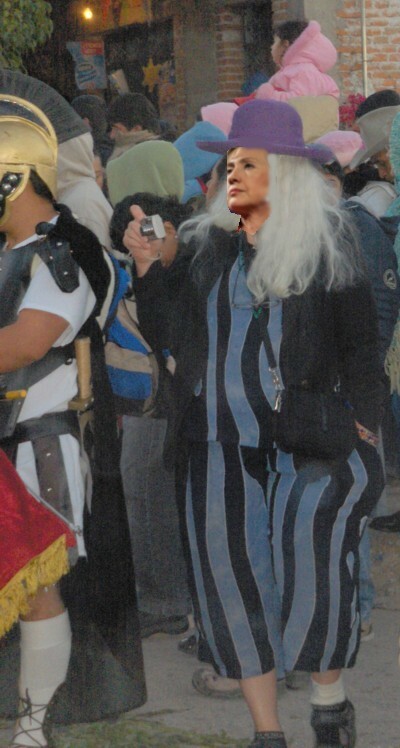 In the past she has taken the soul of a Sorcerer, a Clown, a Lady from the Red/Purple Hat Gang and Hillary Clinton. They are now part of who she is. And now she wants the soul of a Roman Soldier. Perhaps she wants his helmet or cute skirt or knee high socks. Look in the Jardin, soon to see what part of his soul she took. Gracias to Jenny Formanek for the picture. Hillary was still a candidate at the time this picture was taken. This gang is identified by the yellow bag they carry announcing they are part of the Warren Hardy Gang. Warren is one of the few men to develop a large well organized Gang in San Miguel. He and his partner Tuli have been here since 1990 recruiting members. They have four levels of membership. Level 1’s can be seen struggling with their power verbs in the Jardin. They are constantly telling Mexicans what they want, need, like, can, have to and where they are going. Sometimes it is a question and sometimes it is a statement. 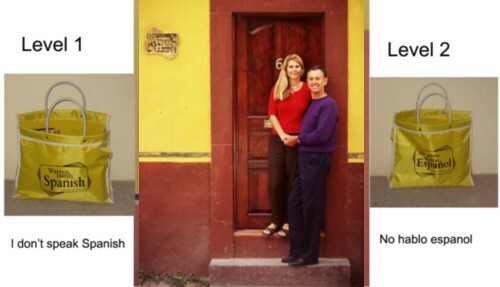 Level’s 2’s live in the past and tell Mexicans what they paid, saw, ate, cooked and where they went. For some this is a chance to reinvent their past in another language. Level 3’s and 4’s are all very tense and have seven and more levels of tension. They can be understood by Mexicans and are very dangerous as they can now buy real estate.